The new base in Syria gives Hezbollah the option of attacking Israel and drawing Israel's return fire away from Lebanon, where its most precious assets are hidden: well over 100,000 rockets and missiles that might be saved for a future battle over Iran's nuclear weapons program. Hezbollah, exploiting its presence in Syria, has been attempting to open a new front against Israel. Over the past 18 months, Hezbollah and its enablers from the Iran's Islamic Revolutionary Guard Corps [IRGC] have begun launching a series of attacks on Israel from their new center of operations in southern Syria. After Sunday's air strike (attributed by the media to the Israel Air Force) that killed 12 high-ranking Hezbollah and IRGC operatives near Quneitra, Syria, along the Israeli border, Israel is bracing for the possibility of an attack by Hezbollah and Iran. Although Israel has not officially taken responsibility for the strike, it would make sense to view the action as a preemptive move designed to remove a clear and present danger arising on Israel's border with Syria. The danger is the formation of a second Hezbollah terrorism base, in addition to Hezbollah's home base already in Lebanon. The IRGC and Hezbollah have begun playing a dual role in the geographical area once known as the Syrian Arab Republic, a country that no longer exists as it appears on world maps. Iran and Hezbollah are acting as the life support machine for the shrunken but still functional Assad regime, now in control of just Damascus, Aleppo, and the Syrian Mediterranean coastline. Since moving into Syria to rescue the regime of Bashar Al-Assad, Hezbollah, acting on orders from Iran, has expanded its presence in several areas of Syria. Iran too has boosted its presence in Syria, primarily though the presence of members of its Revolutionary Guards. At the same time, the IRGC and Hezbollah have begun building a terrorism base in Syria that is directed against Israel, in addition to the Iranian-backed Hezbollah semi-state entity in southern Lebanon. The new base in Syria, at Israel's northeast border, gives Hezbollah the option of attacking Israel and drawing Israel's return fire away from Lebanon, where its most precious assets are hidden: well over 100,000 rockets and missiles that might be saved for a future battle over Iran's nuclear weapons program. Hezbollah is also under domestic Lebanese pressure not to drag Lebanon into a new devastating conflict with Israel. The Hezbollah and IRGC operatives that were targeted in Sunday's airstrike were in the midst of significantly stepping up these attacks. Their plans included rockets and cross-border raids by terror cells. These attack plans were seriously larger in scale than past assaults. It is in this context that Sunday's air strike occurred. Now, all eyes are on northern Israel to see whether Hezbollah and Iran retaliate there. The leader of the IRGC, Major General Mohammad Ali Jafari, on Tuesday threatened Israel with "devastating thunderbolts" -- threats Israel cannot afford to take lightly. It would be safe to assume, however, that Hezbollah wishes to avert the outbreak of an all-out conflict. Such a war would expose Lebanon to unprecedented Israeli firepower, and would also expose Israel to unprecedented Hezbollah rocket attacks and cross-border infiltrations by land, air and sea. If such a conflict were to break out, many parts of southern Lebanon could lie in ruins, and Hezbollah's many Sunni enemies in next-door Syria could seize on the weakness of their Shi'ite foes and pounce, dragging Lebanon into the Syrian war. That kind of outcome would not benefit Hezbollah or Iran in any way. But in the Middle East, miscalculations have led to costly errors in the past, and events can take on a life of their own. 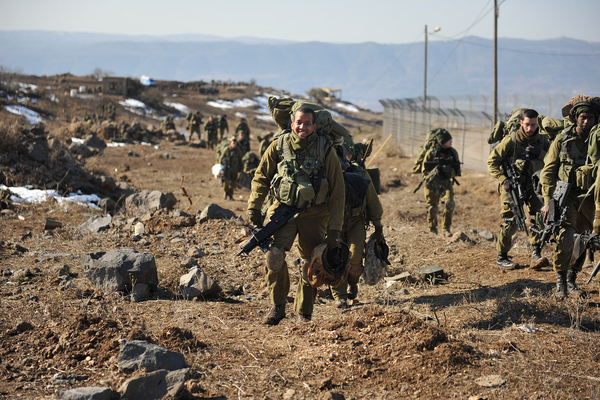 While Israel's taking of the Golan Heights from Syria seemed like an overreach to many in the west, the wisdom of that decision is now coming into play. Imagine the failed state of Syria with Iran and Hezbollah's military presence on the heights looking down into Israel and licking their lips. This would spell disaster for Israel as Iran would place rockets capable of reaching anywhere into Israel. The recent attack by the IAF on the convoy along Syria's border killing military leaders of Hezbollah and a high ranking Iranian general was a warning that Israel was watching and would not accept their military presence on the border of Syria.